Muffins are definitely a prefect satisfying and filling mini cakes,one can have at anytime of the day depending upon their hungry tummy asks for.Muffins with a cup of coffee or tea makes a super filling breakfast or snacks or else simply as a dessert after a simple meal. Obviously i do bake variety of muffins as they are quick to bake when compared to breads. 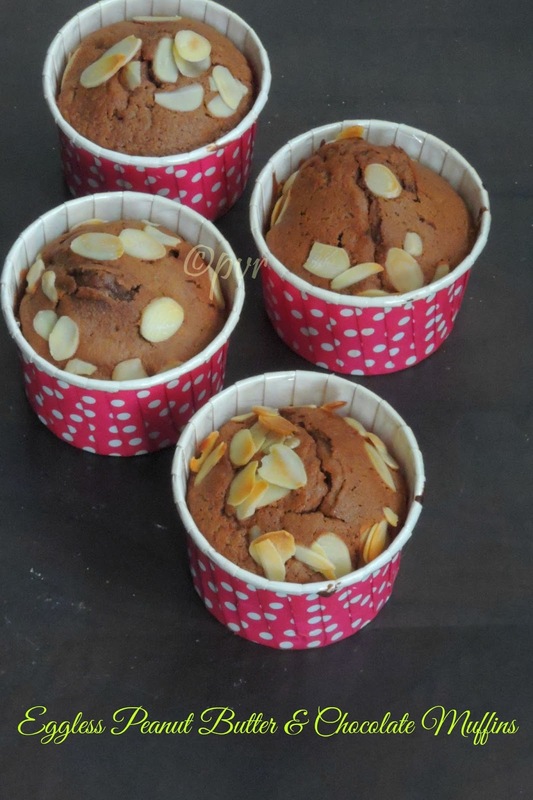 My kids like muffins than breads for their breakfast.Today's post is a simple,very moist, super flavourful and easy peasy muffins i simply baked few days back with peanut butter, chocolate and with almond meal. 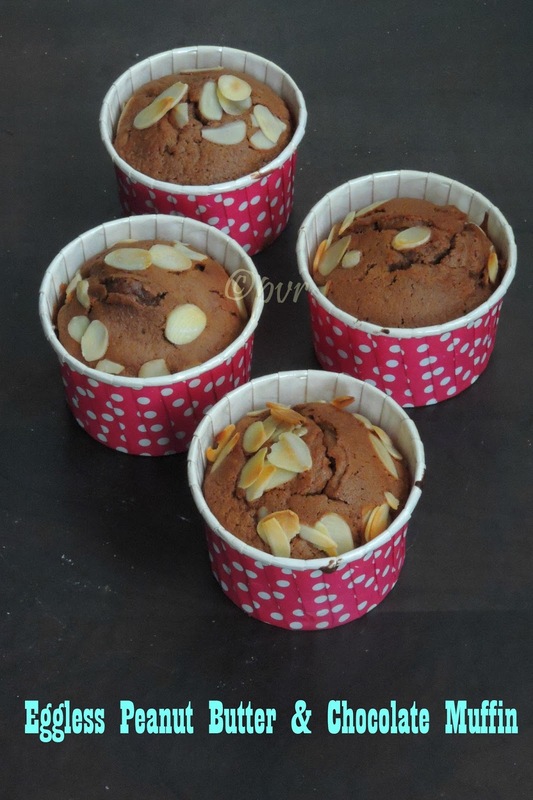 Muffins came out extremely fabulous with a spongy texture eventhough its an egglessbake.This muffins suits prefectly for a quick snacks, breakfast and why not to enjoy while watching a movie, you can carry this muffins very well in your snackbox. Even a kid can make these cuties easily with an adult's help. In a bowl, mix the oil,yogurt and peanut butter together. Mix in the sugar and vanilla. In a separate bowl, mix the baking soda, baking power, salt, cocoa powder,almond meal to the flour and add this dry ingredients to the wet ingredients. Spoon into paper cup or greased muffin pan. Sprinkle the almond flakes generously. Bake for 20-25minutes or until a skewer when inserted, comes out clean. Almond flakes on top of the muffins are inviting. Indeed a nice snack to munch on watching a movie. OMG! these muffins look so tempting. The almond flakes add to the charm of the muffins, I should say. Looks wonderful Priya and makes a great snack during a movie! Peanut butter and chocolate-tasty combo. The almond slivers look soo good Priya. Superb snack! You are a pro Priya, loved the muffins, they look fabulous. wow perfectly baked and the combination of peanut butter and chocolate sounds interesting..
Muffins looks so delicious .You are such a professional baker.Great ! These are so cute! The little muffin cups are adorable. Love the combo aks!! yummy muffins!! Kids will go gaga over these cute looking muffins. So flavoursome plus almond flakes...sounds delicious! Hi Priya, These muffins are amazing. Thank you for the recipe. One quick question - I have similar paper cups at home. Should I directly bake them in my OTG (Morphy Richards) or use a muffin tray to place these paper cups? 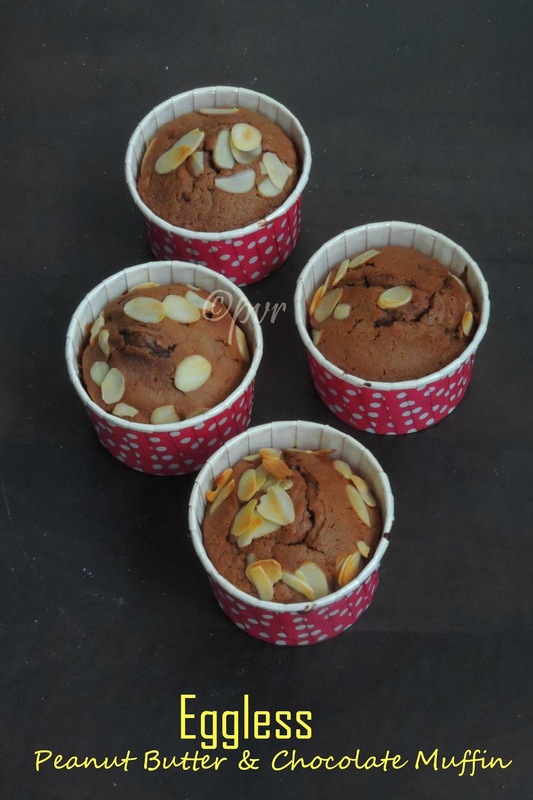 @Pooja Raval Hello thanks for ur encouraging words, no u can use them directly to bake in oven, u doesnt need muffing tray to place these paper cups, hope this helps..